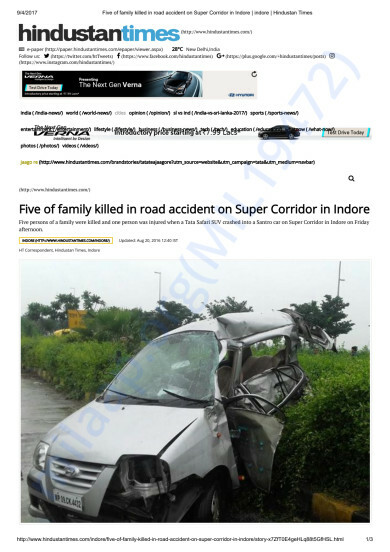 On 20th August 2016,while returning from the celebration of Raksha Bandhan,a tragic accident took away the life of Rameshwar Jatwa,(an Assistant Professor of Devi Ahilya Vishwavidyala)and his younger teenage son.The impact of the collision was such that his car rolled several times in the air before crashing down.Thereby killing five members(his son and three aunts) of his family on the spot including him. Facebook notifications and news content was enough to shake everyone's world a bit.We,his batch mates (M.Sc Life sciences 2003 batch) of DAVV,were dumbfounded on hearing this.We got connected with each other after several years just to know the authenticity of this news.On knowing the Truth,everyone of us felt the tremor of the uncertainties of Life. Why I say this,which is the eternal Truth?After all who knew among us that he would leave us just at the age of 36 years. We were happy for him,after all he had fought all odds to reach the place where he was.We remember him as a hardworking, jovial guy who was trying his best to overcome his struggles.He was not as privileged as we were....from a small village as a farmer to an academician in a university,had been a long journey for him.We were in the University to build up our future careers,while he was there for his survival.When we were enjoying our carefree college life,our classmate Rameshwar was already burdened with the responsibilities of a Marriage.We were still kids,while he was already a Father of two toddlers. While juggling several tasks from being a weekend Farmer and toiling in his fields to being a responsible Husband and Father,he managed to complete his PhD. But as they say,God is in need of good people,He was called back to his heavenly Abode before he could reap the benefits of his hard work. Rameshwar is now survived by his wife Sangita and elder son Pradeep who is yet to complete his education.Words won't be enough to describe the trauma they are facing now. His wife is not that educated to take up a decent job nor son in a stage to work. We,all his batch-mates, don't want his efforts to go in vain and have come up together to setup this Fundraise to atleast support his son's education.Its unimaginable to even think of, what Sangita might be going through after losing her husband and younger son at the same time. Why so much of Delay? Because, as usual all of us got busy in our own schedule and Life not realizing that someone's Life had come to a stand still.And no one in his family or relatives is that much educated who could think of such a move. It was only when Facebook reminded us about his birthday ,this year when it brought back all the memories of our deceased friend Rameshwar Jatwa. It was heartbreaking to know the condition of his wife and son. After all every drop counts in an Ocean.....we don't want to lose HOPE...Please HELP!! Thank you Sudhir Singh,Sanjit Kumar and an Anonymous Donor for your support. We have finally decided to close this campaign, withdraw the collected funds and hand it over to Rameshwar's wife. Though the campaign itself was not successful,yet it had a positive impact on the lives of people associated with Rameshwar Jatwa. First,his family got to know that there are plenty of people around who are supportive to them even in the absence of Rameshwar Jatwa. 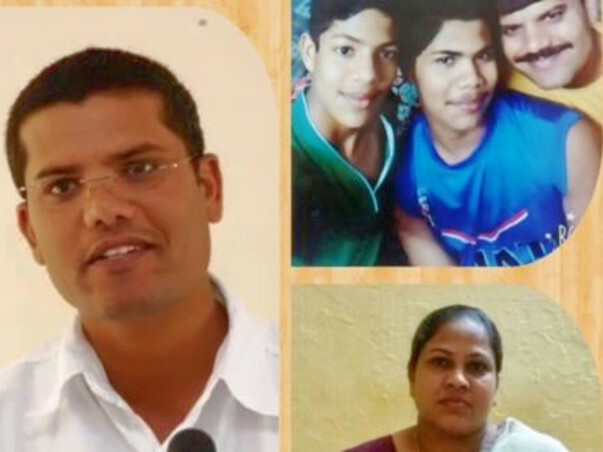 Second,the Alma mater of Rameshwar who felt helpless with his loss and wanted to come forward and support,did join hands to bring about the minute change in his family's life. I am happy to share this news that Rameshwar's wife was overwhelmed to see this response.Though people were not around her but she still, felt their presence. She got the strength to move forward in her life. She has accepted the job of "peon" from the University.Its just a small step forward but we all wish her to take greater strides in her Life!! Thank you, all donors who showed their compassion for this campaign. My heartfelt gratitude to Kajal Kanchan, Veera Vyas Shweta Sharma Chanchala Singh Abhishek Chandra,Arun, Anubhuti Mittal, Lipika, Arjun, Tanzin, Sonal, Saurabh, Niharika, Viplendra Pratap Singh Shakya, Surya, Hamendra,Sharad, Deepika Pothiraju, Mayank, Bharat, Anamika Krishanpal, Dipti Chourasia, and all the Anonymous donors.Thank you for supporting. However, sorry to inform that we were unable to meet our target!! We were unable to reach even half the target and tomorrow is the last day for this campaign. For donors, This is an update; we will still be able to withdraw the collected amount and hand it over to Rameshwar Jatwa's family. In the meanwhile, I got to know that Rameshwar's elder son, Pradeep was unable to clear his 12th board exams due to all the trauma he faced.So he would re-appear his exam in the coming year. While Rameshwar's wife is an asthma patient, needs regular medical examination and medicines, so hopefully, this money will do some help to them.